This article is about the social division. For other uses, see Commoner (disambiguation). "Common people" and "The masses" redirect here. For the Pulp song, see Common People (song). For other uses, see The Masses (disambiguation). The common people, also known as the common man, commoners, or the masses, are the ordinary people in a community or nation who lack any significant social status, especially those who are members of neither royalty, nobility, the clergy, nor any member of the aristocracy. In Europe, a distinct concept analogous to common people arose in the Classical civilization of ancient Rome around the 6th century BC, with the social division into patricians (nobles) and plebeians (commoners). The division may have been instituted by Servius Tullius, as an alternative to the previous clan based divisions that had been responsible for internecine conflict. The ancient Greeks generally had no concept of class and their leading social divisions were simply non-Greeks, free-Greeks and slaves. The early organisation of Ancient Athens was something of an exception with certain official roles like archons, magistrates and treasurers being reserved for only the wealthiest citizens – these class-like divisions were weakened by the democratic reforms of Cleisthenes who created new vertical social divisions in contrasting fashion to the horizontal ones thought to have been created by Tullius. 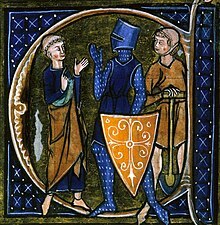 A Medieval French manuscript illustration depicting the three estates: clergy (oratores), nobles (bellatores), and commoners (laboratores). With the growth of Christianity in the 4th century AD, a new world view arose that would underpin European thinking on social division until at least early modern times. Saint Augustine postulated that social division was a result of the Fall of Man. The three leading divisions were considered to be the priesthood (clergy), the nobility, and the common people. Sometimes this would be expressed as "those who prayed", "those who fought" and "those who worked". The Latin terms for the three classes – oratores, bellatores and laboratores – are often found even in modern textbooks, and have been used in sources since the 9th century. This threefold division was formalised in the estate system of social stratification, where again commoners were the bulk of the population who are neither members of the nobility nor of the clergy. They were the third of the Three Estates of the Realm in medieval Europe, consisting of peasants and artisans. Social mobility for commoners was limited throughout the Middle Ages. Generally, the serfs were unable to enter the group of the bellatores. Commoners could sometimes secure entry for their children into the oratores class; usually they would serve as rural parish priests. In some cases they received education from the clergy and ascended to senior administrative positions; in some cases nobles welcomed such advancement as former commoners were more likely to be neutral in dynastic feuds. There were cases of serfs becoming clerics in the Holy Roman Empire, though from the Carolingian era, clergy were generally recruited from the nobility. Of the two thousand bishops serving from the 8th to the 15th century, just five came from the peasantry. The social and political order of medieval Europe was relatively stable until the development of the mobile cannon in the 15th century. Up until that time a noble with a small force could hold their castle or walled town for years even against large armies - and so they were rarely disposed. Once effective cannons were available, walls were of far less defensive value and rulers needed expensive field armies to keep control of a territory. This encouraged the formation of princely and kingly states, which needed to tax the common people much more heavily to pay for the expensive weapons and armies required to provide security in the new age. Up until the late 15th century, surviving medieval treaties on government were concerned with advising rulers on how to serve the common good: Assize of Bread is an example of medieval law specifically drawn up in the interests of the common people. But then works by Philippe de Commines, Niccolò Machiavelli and later Cardinal Richelieu began advising rulers to consider their own interests and that of the state ahead of what was "good", with Richelieu explicitly saying the state is above morality in doctrines such as Raison d'Etat. This change of orientation among the nobles left the common people less content with their place in society. A similar trend occurred regarding the clergy, where many priests began to abuse the great power they had due to the sacrament of contrition. The Reformation was a movement that aimed to correct this, but even afterward the common people's trust in the clergy would continue to decline – priests were often seen as greedy and lacking in true faith. An early major social upheaval driven in part by the common people's mistrust of both the nobility and clergy occurred in Great Britain with the English Revolution of 1642. After the forces of Oliver Cromwell triumphed, movements like the Levellers rose to prominence demanding equality for all. When the general council of Cromwell's army met to decide on a new order at the Putney Debates of 1647, one of the commanders, Colonel Thomas Rainsborough, requested that political power be given to the common people. According to historian Roger Osbourne, the Colonel's speech was the first time a prominent person spoke in favour of universal male suffrage, but it was not to be granted until 1918. After much debate it was decided that only those with considerable property would be allowed to vote, and so after the revolution political power in England remained largely controlled by the nobles, with at first only a few of the most wealthy or well-connected common people sitting in Parliament. The rise of the bourgeoisie during the Late Middle Ages, had seen an intermediate class of wealthy commoners develop, which ultimately gave rise to the modern middle classes. Middle-class people could still be called commoners however, for example in England Pitt the Elder was often called the Great Commoner, and this appellation was later used for the 20th-century American anti-elitist campaigner William Jennings Bryan. The interests of the middle class were not always aligned with their fellow commoners of the working class. Social historian Karl Polanyi wrote that in 19th-century Britain, the new middle class turned against their fellow commoners by seizing political power from the upper classes via the Reform Act 1832. Early industrialisation had been causing economic distress to large numbers of working class commoners, leaving them unable to earn a living. The upper classes had provided protection such as workhouses where inmates could happily "doss" about and also a system of "outdoor"  relief both for the unemployed and those on low income. Though early middle class opposition to the Poor Law reform of William Pitt the Younger had prevented the emergence of a coherent and generous nationwide provision, the resulting Speenhamland system did generally save working class commoners from starvation. In 1834 outdoor relief was abolished, and workhouses were deliberately made into places so dehumanising that folk would often prefer to starve rather than enter them. For Polanyi this related to the economic doctrine prevalent at the time which held that only the spur of hunger could make workers flexible enough for the proper functioning of the free market. Later the same Laissez-faire free market doctrine led to British officials turning a blind eye to the suffering in the Irish potato famine and various Indian famines and acts of exploitation in colonial adventures. By the late 19th century, at least in mainland Britain, economic progress has been sufficient that even the working class were generally able to earn a good living, so working and middle class interests began to converge, lessening the division within the ranks of common people. Polanyi writes that on continental Europe middle and working class interests did not diverge anywhere near as markedly as they had in Britain. After the French Revolution, the Napoleonic wars and with industrialization, the division in three estates - nobility, clergy and commoners - had become somewhat outdated. The term "common people" continued to be used, but now in a more general sense to refer to regular people as opposed to the privileged elite. Communist theory divided society into capitalists on one hand, and the proletariat or the masses on the other. In Marxism, the people are considered to be the creator of history. By using the word "people", Marx did not gloss over the class differences, but united certain elements, capable of completing the revolution. The Intelligentsia's sympathy for the common people gained strength in the 19th century in many countries. For example, in Imperial Russia a big part of the intelligentsia was striving for its emancipation. Several great writers (Nekrasov, Herzen, Tolstoy etc.) wrote about sufferings of the common people. 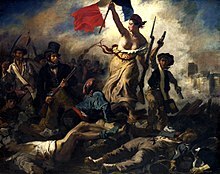 Organizations, parties and movements arose, proclaiming the liberation of the people. These included among others: "People's Reprisal", "People’s Will", "Party of Popular Freedom" and the "People's Socialist Party". In the United States, a famous 1942 speech by vice president Henry A. Wallace proclaimed the arrival of the "century of the common man" saying that all over the world the "common people" were on the march, specifically referring to Chinese, Indians, Russians, and as well as Americans. Wallace's speech would later inspire the widely reproduced popular work Fanfare for the Common Man by Aaron Copland. In 1948, U.S. President Harry S. Truman made a speech saying there needs to be a government "that will work in the interests of the common people and not in the interests of the men who have all the money." Comparative historian Oswald Spengler found the social separation into nobility, priests and commoners to occur again and again in the various civilisations that he surveyed (although the division may not exist for pre-civilised society). As an example, in the Babylonian civilisation, The Code of Hammurabi made provision for punishments to be harsher for harming a noble than a commoner. ^ a b c Gary Day (2001). Class. Routledge. pp. 2–10. ISBN 0-415-18223-9. ^ Though Plato did recognise a fundamental division into rich and poor – "Any city, however small, is in fact divided into two, one the city of the poor, the other of the rich; these two cities are at war." – The Republic (Plato), Part I, book IV. ^ a b Roger Osborne (2006). Civilization: A New History of the Western World. Jonathan Cape Ltd;. pp. 52–56, 292–297. ISBN 0-224-06241-7. ^ "The Three Orders". Boise State University. Retrieved 2013-01-31. Nutini, Hugo G.; Isaac, Barry L. (2009). "Estates and Classes". Social stratification in central Mexico, 1500-2000. University of Texas Press. pp. 20–23. ISBN 0-292-71944-2. ^ DEVAILLY, Le Berry du X siècle au milieu du XIII siècle, p. 201; CHEDEVILLE, Chartres et ses campagnes, p.336. ^ PERROY, E., Le Monde carolingien, Paris, SEDES, 2.ª ed., 1975, p.143. ^ BRETT, M., Middle Ages, Encyclopædia Britannica, 15.ª ed., 1979, 12, p.1965. ^ a b c Philip Bobbitt (2003). The Shield of Achilles: War, Peace, and the Course of History. Penguin. pp. 80, 108, 486. ISBN 978-0-14-100755-7. ^ Outdoor relief means monetary or other assistance given to the poor without them needing to enter a workhouse to receive it. ^ Though some Lords, Ladys and well to do church people continued to offer it, in defiance of the Law. ^ Henry Wallace (February 1942). "The Century of the Common Man". Winrock International. Archived from the original on 2007-09-29. Retrieved 2011-06-30. ^ Byron Almnn; Edward Pearsall (2006). Approaches to meaning in music. Indiana University Press. p. 88. ISBN 978-0-253-34792-3. ^ Spengler, Oswald (1922). The Decline of the west(An abridged edition). Vintage Books, 2006. pp. passim, see esp 335–337. ISBN 1-4000-9700-2.